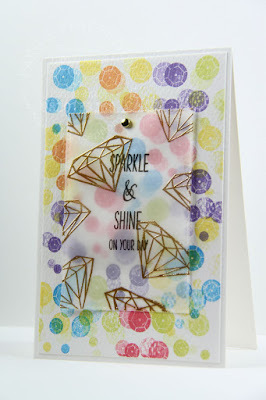 to make this card, I started with the sequins dies from Papertreyink. I stamped them in rainbow colours to create a background. I then die cut a vellum panel using Simon Says Stamp Stitched rectangle dies and heat embossed the sentiment and the diamonds from Winnie and Walter's My Precious stamp set on the panel. I overlayed the panel on the background and held it in place with a gold brad from recollections. This is truly one of my favourites!